HC-SR 501 PIR infrared sensor module is based on infrared technology, automatic control products. High sensitivity, high reliability, low power consumption, low voltage operation mode. Widely used in various auto-sensing electrical equipment, especially for battery-powered automatic control products. – Compatible with ARDUINO, RASPBERRY PI, AVR, PIC, 8051, etc. Product Description: PIR infrared sensor module is based on infrared technology, automatic control products. High sensitivity, high reliability, low power consumption, low voltage operation mode. Widely used in various auto-sensing electrical equipment, especially for battery-powered automatic control products. Automatic induction : to enter the sensing range of the output is high, people leave the sensing range is automatically delay off high, output low. Photosensitive control (optional, not factory setting) can be set photosensitive control, day or light intensity without induction . Temperature compensation ( optional, not factory setting ) : In the summer, when the ambient temperature rises to 30 ~ 32 , detection distance is slightly shorter, temperature compensation can be used for certain performance compensation. Repeatable trigger: the sensor output high, the delay period, if there is human in its sensing rangeActivities, the output will remain high until after the delay will leave high to low (sensor module inspection Measured the body`s every activity will be automatically extended a delay time period, and the final event of the time delay The starting point of time ) . With induction blocking time ( default setting : 2.5S block time ) : sensor module output every time after induction (high variable To the low level), you can set up a blockade followed by time period, during this time period does not accept any inductive sensor signals.This function can be achieved ” sensor output time ” and ” blocking time “interval between the work can be applied to interval detection Products; while this feature can effectively inhibit the load switching process for a variety of interference. ( This time can be set to zero seconds- tens of seconds ) . Wide operating voltage range: default voltage DC 3.6V ~ 20V . 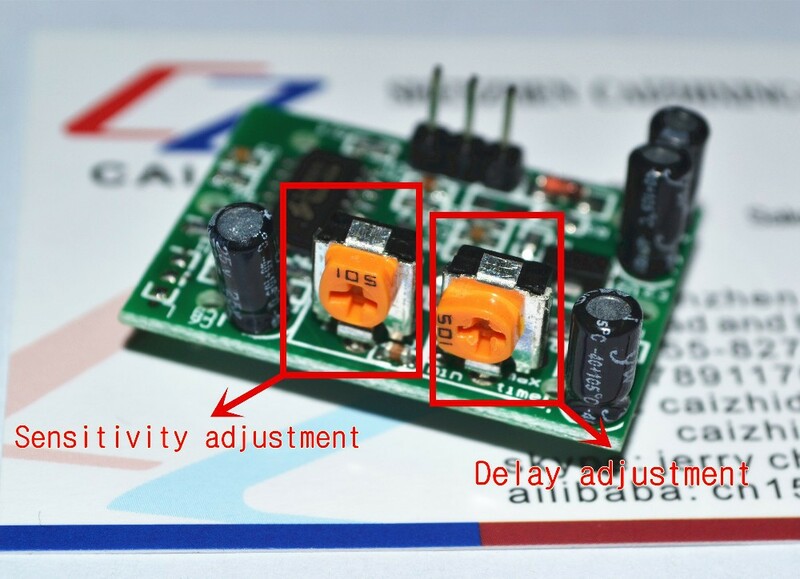 Micropower : quiescent current <50 microamps, especially for battery-powered automatic control products. High output signal: the circuit can be easily implemented with various docking. Note: adjust the distance potentiometer clockwise, sensing distance increases (about 7 meters), on the contrary, sensing distance decreases (about 3 meters). Delay adjustment potentiometer clockwise induction delay longer (approximately300S ), on the contrary, the induction delay cut short (about 5S ). sensor module powered a minute or so after the initialization time, during which interval the output module0-3 times, one minute after entering standby. should try to avoid direct lighting and other interference sources close to the lens surface of the module, in order to avoid introducing interference signal malfunction; avoid the use of environmental flow of the wind, the wind sensor will also cause interference. sensor module with dual element probes, probe window is rectangular, dual ( Amillion B Yuan) located at both ends of the longer direction, when the body from left to right or right to left walked , dual infrared spectroscopy arrive time, distance difference, the greater the difference, the more sensitive the sensor, when the body from top to bottom or front to probe or direction from the bottom to walk, the dual IR undetectable changes in the distance, no difference value, so the sensor insensitive or does not work; sensor should be mounted so that the direction of the probe with dual direction of human activity up to parallel as possible to ensure that the human body has been passed by the dual sensor probe. To increase the sensing range of angles, the module uses circular lens, but also makes sense probe all sides, but still higher than the top and bottom right and left direction sensing range, sensitivity, strong, installation still possible according to the above requirements. This entry was posted in Ardunio Sensors, Distance/Range Sensors & Object Detection and tagged ARDUINO, AVR, HC-SR501, human motion sensor, motion, Motion sensor, MOTION SENSOR DETECTOR MODULE, motion-detector, motion-senor, pi, PIR Sensor, raspberry, raspberry-pi, sensor. Bookmark the permalink. There is no dip switch. How do you set the trigger method? There is a Jumper switch on the back side of the module, using that you can select the re-trigger. I have updated the post with updated pictures, which displays that switch. I have received a pir sensor just now. There is no jumper selection available and this product is little bit different than what is how in the Web site.